Do you follow me on Facebook? Why the hell not, fool? Or thank you very much, as the case may be. I enjoy pumpkin-based comestibles - to a point. Pumpkin pie, pumpkin cake, even pumpkin soup (the secret is freshly grated ginger). But at this time of year people start going crazy over some overpriced concoction from Starbucks called a pumpkin spice latte, and I don't get it. I freely admit to an anti-Starbucks bias. The appeal of the corporate coffeehouse culture eludes me. More fundamentally, however, I'm just not a fan of so-called "coffee drinks." Milk, sugar, chocolate shavings, and whipped cream are all wonderful things, but they have no business mixing with the noble coffee bean. I like my coffee the way I like my men: strong and black. Also, Beloved Spouse is neither black nor particularly strong. But it's too good a line to go to waste. but Starbucks is willing to do it and charge you five bucks to drink it. I respect others' coffee choices. After all, I think PB&J vodka is among the greatest inventions of the 21st century. Your mileage may vary. Note to self: Possible to inject vodka into Uncrustables? Investigate. Anyway, the pumpkin spice latte is what inspired the photo and accompanying caption on my Facebook page. Minutes later, someone sent me this. First: Saying it in Ermahgerd does not exempt you from being beaned with a pumpkin. Second: Can we all stop using Ermahgerd soon? We've had a good laugh, but enough is enough. Our guinea pig's middle name is Ermahgerd, for crying out loud. In a couple of years she's going to feel like all the kids whose parents named them Rainbow and Miracle in the 60s. 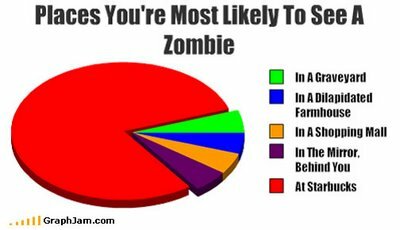 Third: If that drawing doesn't prove the zombies-Starbucks link, I don't what know what does. Seriously, that is frightening. Fourth: Did she become zombiefied in 1986? Because that's the last time I saw anyone rock the baggy sweater with paisley vest look. Maybe she was bitten by Nancy Reagan. Fifth: I just now realized: The pumpkin spice latte is the McRib of the coffee world, isn't it? 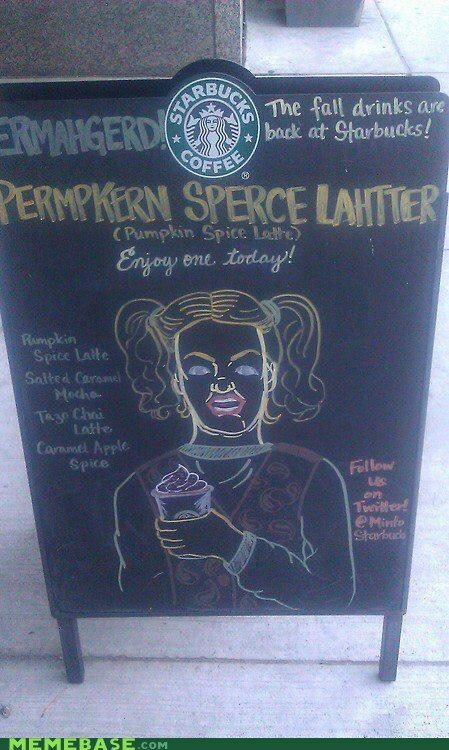 Anyway, enjoy your pumpkin spice lattes, devotees of pumpkin spice lattes. I'll stick to plain coffee and flavored vodkas. Both of which are available year-round, by the way. Mmmmm...cheap, plentiful drugs. And whatever you do, don't offer me one. I would most likely find it delicious and become a zombie. Coffee-flavored vodka is apparently a thing that exists in this world (who knew?). Would you consider this as "two great tastes that taste great together?" or as heresy? Love the cocktail idea! How do you feel about the pumpkin milkshake from Jack in the Box? It's really pretty good and fairly cheap. I bet you could even add vodka to it to make it even better!